Any special woman in your life, whether she be a mother, grandmother, partner, daughter or friend deserves a special personalised necklace. This custom rose gold necklace is linked with rose gold chain in between each pendant and makes the perfect gift for her. 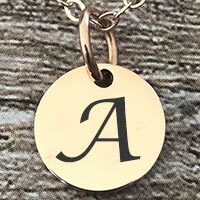 This simple yet attractive rose gold charm necklace makes the perfect gift for Mother’s Day, birthdays, anniversaries or to celebrate a new Mum. 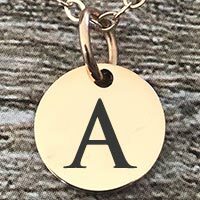 The circular shaped rose gold charm can easily be personalised with up to one initial of a loved one. There are several options available to further personalise this stunning necklace, including the addition of up to 4 pendants. It includes a gold-filled chain from 45 centimetres for one pendant through to 55 centimetres for 4 pendants.